If you’re a fan of Claptone or Gorgon City, then you’ll need to come to APEX Social Club in April. Both DJs are playing late night sets at this Vegas nightclub, and these are events that you won’t want to miss. On Thursday, April 4th, Claptone will be playing a late night set here at Apex. Hailing from Berlin, you won’t be able to miss DJ and producer, Claptone, thanks to his signature golden bird mask. Claptone’s mixes are ideal for a great night out at the club, featuring great rhythms and chords that fall somewhere between deep house music and up-tempo dance tracks. Claptone’s career began in 2011 with the release of a series of singles, including a cover of “Lifght My Fire.” Claptone’s remixes quickly garnered attention, and soon his clients included groups like the Pet Shop Boys. In 2015, Claptone released Charmer, his first full-length album. The album featured musical greats such as Clap Your Hands Say Yeah, Young Galaxy, and Peter Bjorn & John. In 2016, Claptone released the double-mix album, The Masquerade. His latest album, Fantast, was released in June 2018. Claptone earned numerous awards throughout his career. In both 2017 and 2018 he won the DJ Mag Top 100 awards for #1 Highest House DJ. In 2015 he won the Ibiza DJ Award for Best Producer, and in 2016 and 2017 he won the Ibiza DJ Award for Best House Act. It’s refreshing to see an artist take such a different approach to the music world today. Claptone is, essentially, an enigma. His official biography speaks of a dreamy emergency of a bird wearing a golden mask. There’s little information to be found about the man himself, leaving us to focus on his music alone. That’s easy to do, since the mixes are filled with emotion and depth, yet are also ideal for a night out at the club. Claptone’s performance right here at APEX is one that you won’t want to miss. On Saturday, April 6th, catch Gorgon City’s late night set at Apex. UK duo Gorgon CityKye Gibbon and Matt Robson-Scott are a hugely in-demand act that you can catch on SiriusXM. Gorgon City first started out playing in London basement rooms, but they’ve come a long way since. After releasing their debut single in 2012, they followed with the release of “Sirens” in 2014. That album contained six UK hit singles and launched Gorgon Cityinto the spotlight. The duo proved true to their roots, moving away from performances with a full live band back into extended DJ sets that highlight their origin in the underground house and techno scene. They have held a residency at Amnesia Ibiza and we’re thrilled to have them here with us for a special performance. Gorgon City is sure to be just in the beginning of their musical career. We always bring you the best entertainment in Las Vegas, and Claptone and Gorgon City are sure to put on huge performances here during April. If you want to make the most of these special performances, consider making a Bottle Service reservationfor your group. There are tons of perks to Bottle Service, and you and your party will get the ultimate VIP treatment with your reservation. You’ll gain the fastest entry into APEX without having to wait in line. Your whole group also receives complimentary entry into the club. Next, you’ll be escorted to your own private area in a prime location with some of the best views of the club. Private servers will wait on you, and private security staff will make sure that only people you invite into your private area are allowed. Don’t forget that not only will you have a great view of the entertainment, but other clubgoers can see you, too, and the special VIP treatment you’re receiving. This can be a chance to meet new people and make new friends. Because your bottles will be brought to your table, you won’t ever have to get up to go to the bar, so you can focus on enjoying the night and the music. Your bottles come with complimentary mixers, so you and your party can mix your own drinks to taste. 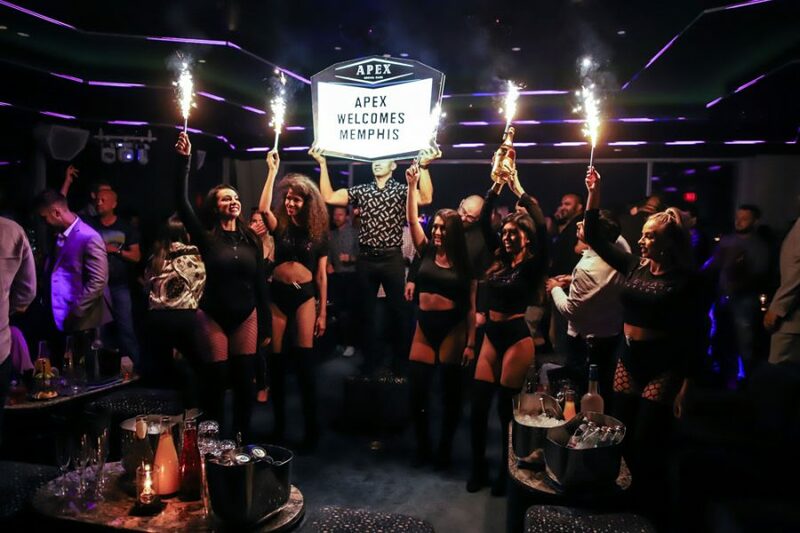 You won’t want to miss a minute of these epic performances, and a Bottle Service reservation means that you and your friends can make the most of a special night at APEX. Claptone and Gorgon City’s late night sets at APEX are all the talk for April. But don’t wait – get on the guest list for the weekend! These are two amazing nights that you won’t want to miss.